It’s Write Now is celebrating it’s 3 month anniversary. We passed the 90 day mark yesterday. I recently purchased an 8-Gig, Red, iPod, Nano, Video. I liked it so much, I decided to pick up another one, to give to one of my Lucky Readers. This is a very simple contest and everyone (with a blog), is encouraged to participate. A post in a forum doesn’t count. I’m sorry. In order to enter all you have to do is create a post or mention me in a post with a link to It’s Write Now and a link to the contest post. Then submit a comment on this post, with the URL to the link post. The entries will be assigned numbers according to the order posted. Such as first entry is number 1. All entries will be put in a random number generator, and one Lucky Winner will be chosen at random. The contest will end on October 31st at Midnight. Oooh Spooky! The winner will be announced by the following Monday, November 5th. Why Red? Because I think it’s the coolest color and it matches my site. If your still sitting on the fence about entering. Watch This! Blogs in English only Please! 213 Comments on "Win An iPod Nano!!!!!! 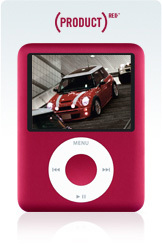 New 8-Gig Red Video iPod Nano"
i am so excited …. That’s a beauty! How do I win? Looks like I’m too late to enter the competition but congratz on the blog! The ipod nano is a very nifty bit of kit, it hasn’t got the capacity of the bigger models but it looks great and holds as much music as I ever need!